The latest and most high-profile departure from Congress, he joins dozens of Republicans who have resigned or retired ahead of the 2018 midterms. WASHINGTON — House Speaker Paul Ryan said Wednesday that he won't seek re-election, joining dozens of Republicans who have announced their plans to retire ahead of the 2018 midterms and setting the stage for an intraparty struggle over who will lead the often-divided conference. "I am announcing that this year will be my last one as a member of the House,” the GOP leader from Wisconsin told reporters, adding that he was resigning because he has achieved most of his agenda and because he no longer wants to be viewed by his children as a "weekend father." 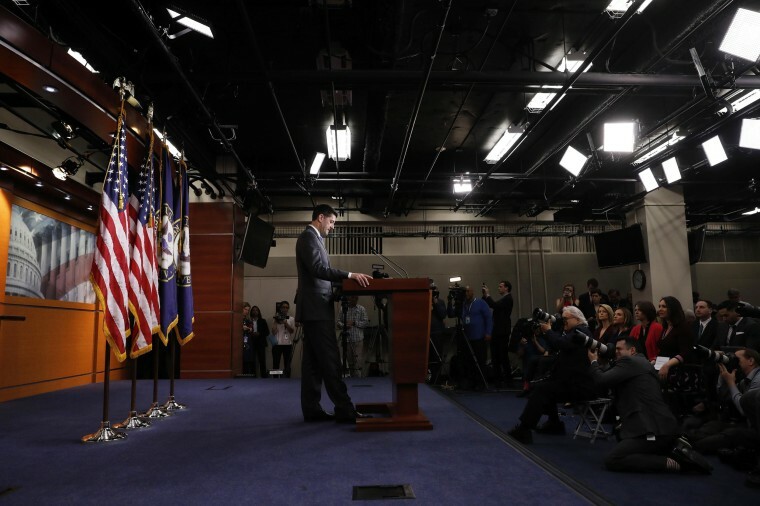 Reflecting on his relatively brief tenure as speaker, Ryan said, "I have accomplished much of what I came here to do." He named last year's tax overhaul and the budget deal reached last month to beef up military funding as two of his biggest achievements, and dismissed the idea that his decision to retire will affect Republican races for the midterm elections. Ryan also said the possibility of Democrats taking the House did not factor into his decision, and reiterated that he intends to finish the year in the leadership position. Ryan told colleagues of his decision before his Wednesday morning news conference, his top aide, Brendan Buck, said in a statement. According to a person familiar with Ryan's decision, he made his choice over the latest two-week congressional recess with his wife, Janna, but an ongoing discussion about his future had been taking place for several months with a small group of his staff and his family. The person also said that Ryan has thoughts on who should succeed him as the Republican leader, and "he will share them at a later time." Axios was the first to report that Ryan, 48, would leave Congress at the end of his term, which expires in January. According to a senior administration official, Ryan spoke with President Donald Trump about his decision earlier Wednesday morning, and the president then tweeted a message of support. Senate Majority Leader Mitch McConnell, R-Ky., said Wednesday that despite the stresses and pressures of being speaker, "Paul’s optimism and energy never waned." "I'm glad we can count on his continued leadership through the rest of this year, because our work together is far from finished," McConnell said on the Senate floor. "I look forward to collaborating closely these next months to implement more of the inclusive, pro-growth, pro-opportunity agenda the American people are counting on us to keep advancing." Ryan, whose departure had been rumored for months, is the highest-profile Republican to join the House's Casualty List, which tracks members of the 115th Congress who have said they're leaving. According to The Tampa Bay Times, Rep. Dennis Ross, R-Fla., announced his retirement on Wednesday as well. Ryan was elected to the House 20 years ago and became speaker in October 2015. He struggled to unite his party on the issues. Health care reforms stalled, while failed negotiations over spending shut the government down. Ryan championed the GOP's tax cuts late last year, securing the lone major legislative victory of Trump's tumultuous first year in office. The top Democrat in the House, Rep. Nancy Pelosi of California, remarked on Ryan's commitment to his political beliefs. "The speaker has been an avid advocate for his point of view and for the people of his district," the minority leader said in a statement. "Despite our differences, I commend his steadfast commitment to our country." Back home in Ryan's Wisconsin district, there are already a number of challengers lined up, including Democrat Randy Bryce, who boasted Tuesday of strong fundraising numbers. He cheered Ryan's announcement with a joke about Republican efforts to repeal and replace Obamacare. "Speaker Ryan sees what is coming in November, and is calling it quits," the Democratic Congressional Campaign Committee said in a statement. "Stay tuned for more retirements as Republicans increasingly realize that their midterm prospects are doomed." Two Wisconsin Republicans had already announced bids for Ryan's seat: Paul Nehlan, who challenged Ryan in 2016 and earned 15.9 percent of the vote, and veteran Nick Polce, whose campaign has not yet gained much traction. The filing date for the August primary is June 1, giving Republicans less than two months to rally additional candidates. In Washington, Ryan's announcement moves the battle for House speaker out of the shadows and gives possible contenders like House Majority Leader Kevin McCarthy, R-Calif., House Majority Whip Steve Scalise, R-La., and others time to gather support for possible bids to lead their conference in the next Congress. McCarthy has been working closely with Trump recently on an effort to cancel funding in the $1.3 trillion spending package Trump signed into law last month, while Scalise is admired by his colleagues. He returned to Capitol Hill in the fall following months of physical therapy after being critically wounded when a gunman opened fire at a congressional baseball game last June. While Ryan has largely endorsed Trump’s agenda, they recently knocked heads over the president’s steel and aluminum tariffs. Many Republicans have opposed the administration’s move, and Ryan said publicly that the tariffs should be more targeted. Ryan has long insisted he never wanted the speakership. He wound up pursuing the gavel after McCarthy dropped out of contention over comments he made regarding Hillary Clinton and the Benghazi investigation. Ryan didn’t lead his conference as long as his predecessor, John Boehner of Ohio, who served as speaker from 2011 to late 2015, and as minority leader from 2007 to 2011. Boehner announced that he would resign in September 2015 after members of the conservative Freedom Caucus threatened to try to overthrow him. Ryan likely views this as a good time to exit Capitol Hill, with Republicans at risk of losing control of the House in the midterm elections, and Democrats hoping for the same type of blue wave they experienced in the 2006 midterms. Steve Stivers, chairman of the National Republican Congressional Committee, said in a statement that Ryan's leadership "has transformed our nation," and that the NRCC's mission to hold the House in the fall "continues unabated." In a second statement on Ross's retirement, Stivers said he was confident that Florida's 15th Congressional District, which Ross has represented since 2011, would remain in GOP hands. Before becoming speaker, Ryan had served as chairman of the powerful tax-writing House Ways and Means Committee and the House Budget Committee, where he repeatedly introduced budget blueprints that sought to reform the nation’s entitlement programs. Alex Moe, Hallie Jackson and Rebecca Shabad reported from Washington, and Jane C. Timm from New York.